The Billabong Pro Jeffreys Bay, Event No. 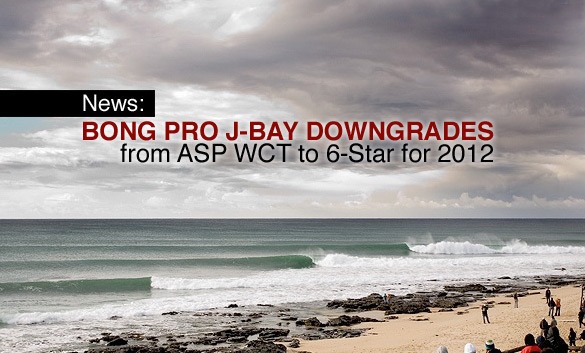 5 of 11 on the 2012 ASP World Championship Tour, has been officially downgraded to an ASP 6-Star event for 2012. The downgrade drops the 2012 ASP World Championship Tour calendar from 11 events to 10, with surfers now counting their best 8 out of 10 results towards their ASP World Title ranking. The 2012 ASP World Championship Tour will commence this Saturday, February 25, 2012, with the Quiksilver and Roxy Pro presented by Land Rover.